The Philippine Air Force held the formal Acceptance, Turn-over and Blessing Ceremony of C-130T aircraft number 5011 today, April 12, 2016, at the CJVAB Grandstand in Pasay City. Secretary of National Defense, the Honorable Secretary Voltaire T Gazmin, led the ceremonial rites as Guest of Honor with the Commanding General, PAF LTGEN EDGAR R FALLORINA AFP, as the military host. The arrival of the first C130T aircraft will add to the present three (3) operational C130 aircraft of the PAF in furtherance of the national military objectives and in support to the national government. On the strength of the Armed Forces of the Philippines Modernization Law (both RA 7898 and 10349), the PAF embarked on their C130T aircraft acquisition project so as to boost its capabilities for the medium tactical airlift requirement of transporting forces rapidly to any parts of the country and even abroad, as well as, to support Humanitarian Assistance and Disaster Relief operations. Highlighting the activity was the formal hand-over of aircraft documents that symbolizes the transfer of C130T aircraft (nr 5011) from the US government represented by His Excellency Philip S Goldberg, the U.S Ambassador to the Philippines, to the Philippine government, represented by the Secretary of National Defense, the Honorable Secretary Voltaire T Gazmin. Likewise, Secretary Gazmin turned-over the same documents to the AFP, represented by AFP Chief of Staff, GENERAL HERNANDO DCA IRIBERRI AFP. GENERAL IRIBERRI then transferred the documents to the PAF, represented by the PAF Commanding General, LTGEN EDGAR R FALLORINA AFP. LTGEN FALLORINA then turned-over the documents to MGEN ARNOLD A MANCITA AFP, the Commander of Air Logistics Command, the unit in charge of entering the aircraft on the book of properties of the PAF. Lastly, MGEN MANCITA gave the documents to BGEN JOSE G MIRANDILLA JR AFP, the Wing Commander of 220th Airlift Wing, the end user unit. The symbolic turn-over rite was followed by the blessing of and ceremonial pouring of champagne on the new aircraft. 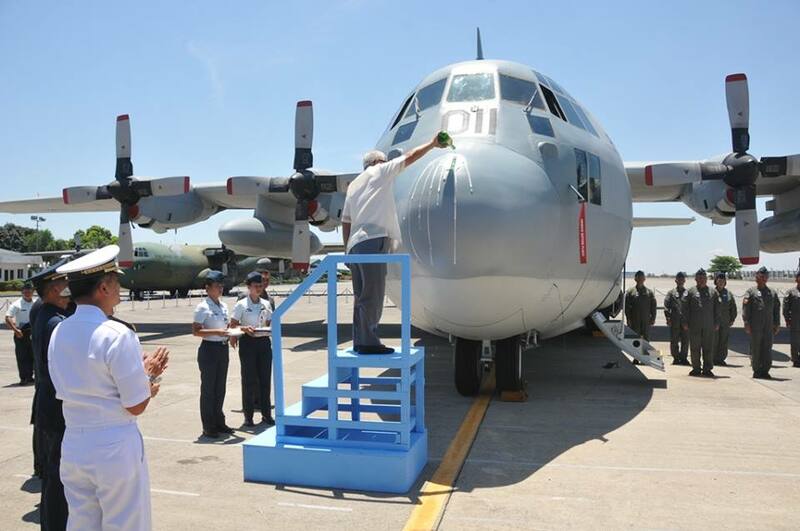 Ambassador Goldberg expressed happiness in seeing the alliance and partnership between the Philippines and the United States getting stronger as exemplified by the ceremonial transfer of the C130T nr 5011. The other one he said is the on-going Philippine-US Balikatan Exercise 2016. He said the US government will continue supporting the PAF as it pursues to acquire more of the C130T aircraft through the exercise of both countries’ mutual defense agreement. C-130T Nr 5011 is the first of two (2) units of newly-bought C-130T aircraft to have arrived. These two C-130Ts were previously being used by the US Marine Reserve for air refueling/tanker operations when they were pulled out from active duty and reconfigured by the Aerospace Maintenance and Regeneration Group in Tucson, Arizona into transport aircraft to support the PAF’s operational lift requirements. The second aircraft is expected to be delivered on either September or October this year. 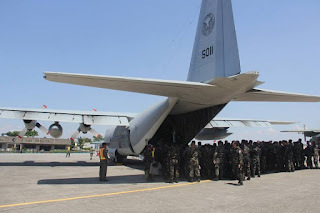 After the blessing, the C130T nr 5011 left Colonel Jesus Villamor Air Base to fly its first operational mission transporting military and civilian passengers to Mactan in Cebu and Laguindingan in Cagayan de Oro. The Turn-over and blessing ceremony of C-130T aircraft number (5011) at Headquarters of the Philippine Air Force, Col Jesus Villamor Air Base, Pasay City, Philippines April 12, 2016.